Tunnel Vent Barn with ridge vent. Photo by Dan Ciolkosz. Agricultural buildings are very important to the successful operation of farms and ranches, and they deserve careful attention when it comes to managing energy expenses. The best time to incorporate energy efficiency that will yield the highest savings and the lowest operating costs is during the design and construction phase. 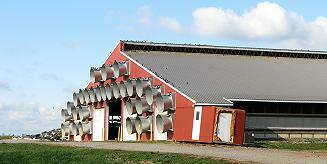 Unfortunately, energy efficiency is often ignored when farm buildings are constructed. Energy efficient building design involves the selection of appropriate energy efficient materials and equipment, and addresses the layout and orientation of the building in a way that is intrinsically energy efficient. 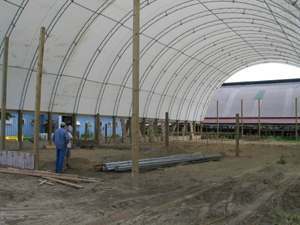 Dairy barn under construction that will utilize passive ventilation. Photo by Vern Grubinger. Find these topics and many other related Farm Energy media resources at the Farm Energy Media archive. Farmers should resist the urge to reduce construction costs by eliminating proven energy efficient equipment and designs. This almost always lowers a farm’s profitability in the long run. There are many improvements that can be made to existing farm buildings that will increase the energy efficiency of the building. Probably the best advice when it comes to farm building energy efficiency is to utilize the services of a qualified energy specialist and a farmstead planner to review your building plans and make recommendations, whether they are for new construction or existing facilities. Having efficient material and traffic flows in and around the farmstead can improve labor as well as energy efficiency. In addition to that, it pays to understand some of the common ways that you can make your farm buildings more energy efficient.